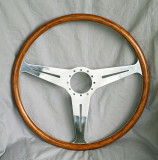 The Camurri steering wheels were made in Modena, Italy, and were used on several cars, including Stanguellini, Bandini, and Moretti. The spokes were solid, drilled, or slotted. The wood rims varied only slightly. 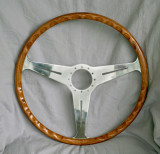 The rim is a unique construction of segmented layers, enveloping the internal metal rim on three sides, which I call a 3/4 wrap. The rim is dimensionally identical to the original.